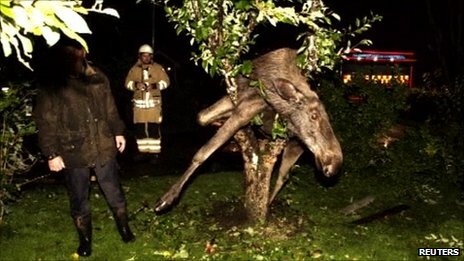 A man in Sweden got a shock when he found a drunk moose stuck in his neighbour’s apple tree. Per Johansson, from Saro near Goteborg, found the moose when he heard a roaring noise from the garden next door. The moose was apparently on the hunt for fermenting apples when she lost her balance and became trapped in the tree. Drunken moose are a common sight in Sweden during autumn, when there are plenty of apples about. Johansson called the emergency services, who helped him free the boozed-up beast by sawing off the tree’s branches. The moose spent the night recovering in the garden. The next day she took herself off into the woods with her hangover.